Above left, Christ the Pantocrator; in the middle, above, the Angel appears to Joseph; below, the Presentation of the Christ Child in the Temple. The Divine Throne with angels to either side. 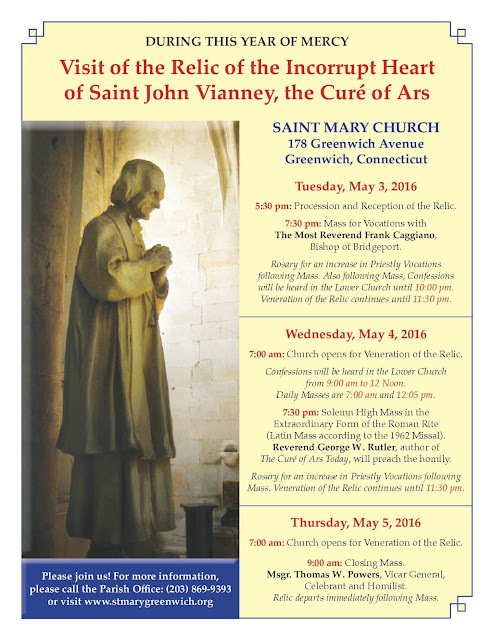 St Mary’s Church in Greenwich, Connecticut, will host the relic of the incorruptible heart of St Jean-Marie Vianney, the patron Saint of parish priests, this coming week, from Tuesday May 3rd until Thursday, May 5th. Details in the flyer below. 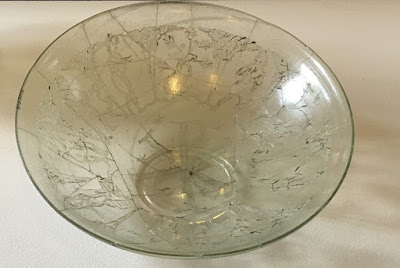 From the church’s website: When (St John’s) coffin was opened his body was found perfectly preserved even though it was never embalmed and is today enshrined in a glass casket above the altar at his parish Church in Ars. As was the custom of the time the heart was removed from the body and placed in a separate reliquary for devotion. 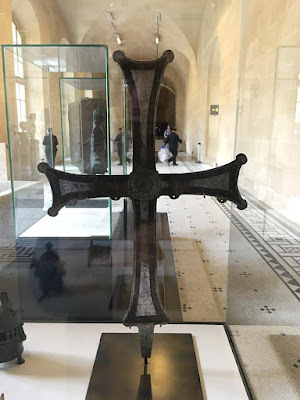 This extraordinary relic on occasion leaves France to visits other Churches throughout the world. Saint Mary Church is delighted to announce that the Bishop of Belley-Ars in France has given his permission for the relic of the incorrupt heart of Saint John Vianney to visit our parish from May 3 to 5! The last time the relic was in the United States was 10 years ago. Bishop Caggiano has requested that during this visit we concentrate on the mercy of God given us through the Sacrament of Penance as well as prayers for an increase in priestly vocations. The Bishop will join us for Mass during the visit and we will have many opportunities for Confession during the three days. In February of this year Fr. 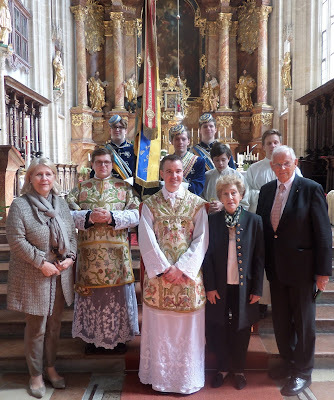 Franz Schmidberger, rector of the SSPX seminary in Zaitzkofen, Germany, wrote a short essay expressing his reasons, from a personal point of view, for members of the Society to accept a normalization of relations with Church authorities. Here we present an English translation of the document “Thoughts about the Church and the Place of the Society of Saint Pius X in it”. Under normal circumstances this is a document we would not have published, because NLM has learned that Fr. Schmidberger wrote it as a private communication. He sent it to the SSPX Superior General, Bishop Bernard Fellay, and to a small circle of colleagues, including fellow professors at the seminary. He did not authorize anyone to release it on the internet, let alone to claim incorrectly that he had sent it to all members of the Society; but in recent days both of these have taken place without his consent. Now that erroneous translations of the text and untrue stories about the document are doing a disservice to innocent readers, Fr. Schmidberger has approved the publication of this authorized translation in English, in order to clear away the errors. I. The Church is a mystery. She is the mystery of the one true God who is present among us, the saving God who desires not the death of the sinner, but that he be converted and live. This conversion requires our cooperation. II. The Church is infallible in her divine nature, but she is led by human beings who can go astray and also be burdened with failings. An office should be distinguished from the person in it at a given moment. The latter holds office for a certain time and then steps down—either through death or through other circumstances; the office remains. Today Pope Francis is the holder of the papal office with the power of the primacy. At some hour that we do not know, he will step down and another Pope will be elected. 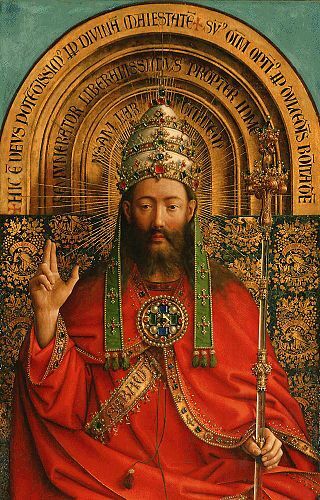 As long as he occupies the papal throne, we recognize him as such and pray for him. We are not saying that he is a good Pope. On the contrary, through his liberal ideas and his administration he causes much confusion in the Church. But when Christ established the papacy, He foresaw the whole line of popes throughout Church history, including Pope Francis. And nonetheless He permitted the latter’s ascent to the papal throne. 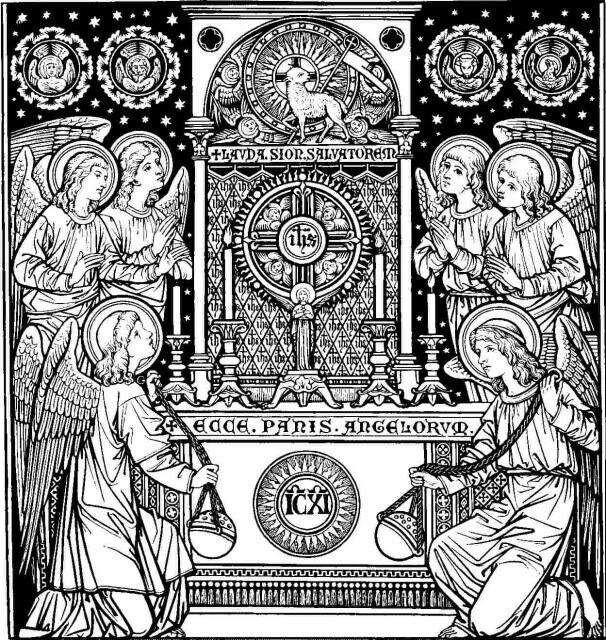 Analogously, the Lord instituted the Most Blessed Sacrament of the Altar with the Real Presence, although He foresaw many sacrileges over the course of history. 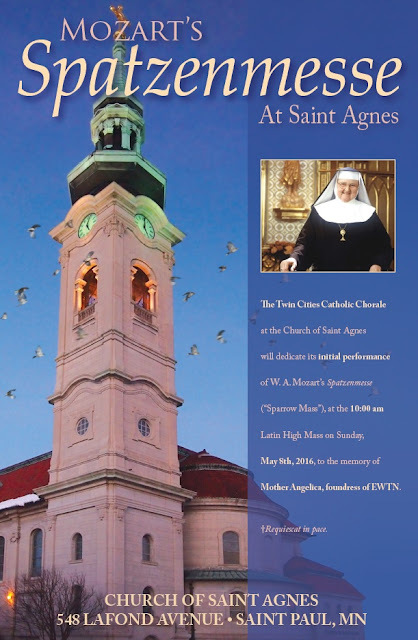 Join the Twin Cities Catholic Chorale for a tribute to Mother Angelica, a performance of Mozart’s Spatzenmesse during a Latin High Mass, at St. Agnes Parish in St. Paul, Minnsota, Sunday, May 8, starting at 10 a.m. It is funny how one story leads to another, or in this case two others. On my blog thewayofbeauty.org, I recently posted an article about my visit to the seminary of the Argentinian order Institute of the Incarnate Word (IVE) in Washington, D.C. 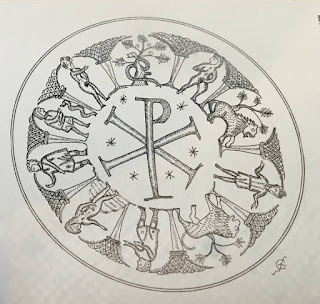 In response, I was contacted by English icon painter Ian Knowles, who told me that order that had commissioned him to paint icons of the Mysteries of the Rosary for a church which they run in Jordan, the Shrine of Our Lady of the Mount. I thought that this might be of interest to NLM readers, so I asked him for pictures and started to dig around for information about the church. 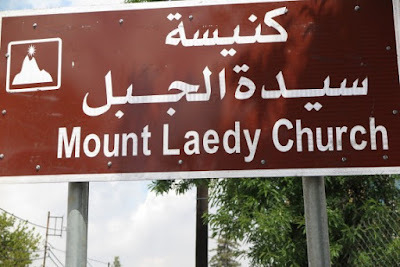 Then I found out that it is also that it is the site of a miracle, validated by the Latin Patriarch of Jerusalem, in which a statue of Our Lady wept tears of blood in 2010. In 2014, IVE presented fellow Argentinian Pope Francis with an image of Our Lady of Anjara when he visited the site of Our Lord’s Baptism in the Jordan. The statue is perhaps 150-200 years old, and was purchased by the church shortly before the miracle occurred. Culture, beauty, prayer and devotion to Our Lady are all aspects of the charism of the order, (you can read about the IVE charism here), and somehow all of this is entwined in a dynamic mix for the mission of the Church in this one shrine in the Middle East. As to the original thrust of the story, the icons: there are some photos below at the bottom of the blog post. Immediately below is artist Ian with one of the panels in progress. (Incidentally I met him several years ago when we both attended a class taught by Aidan Hart!) . 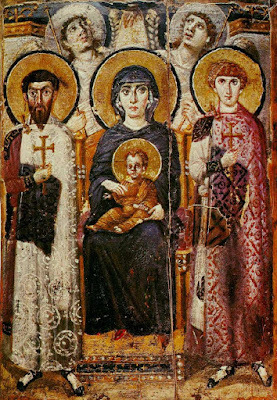 I am so heartened to hear of IVE wanting to encourage “eyes-open prayer” through the commission of these icons. It shows, in my opinion, a true understanding of the New Evangelization, since, regardless of the miracle, the simple beauty of each one of them in the church will surely encourage a deeper prayer that engages the whole person. This will facilitate a supernatural transformation of the person in Christ and lead, in turn, to the transformation of the culture as each person contributes to it, gracefully and beautifully, by simply going about their daily business. The same can be said of the statue. For all the headlines in connection with the miracle, (which I very happily accept as real), it is the supernatural transformation of mankind in Christ, the partaking in the divine nature, that is the truly astounding fact of the Christian faith. This is an extraordinary privilege that is open to every single human person, and leads to a life of such joy. Sometimes, exceptional, headlining events such as miracles are needed to inspire the prayer that will engender what I think are the greater, yet so often neglected and misunderstood truths of the Faith. The account of the miracle is here at the National Catholic Register, and an account of the Pope’s visit is on the IVE site, here. The order is devoted to Our Lady with a special devotion to the Immaculate Conception and Our Lady of Lujan, a South American holy image. 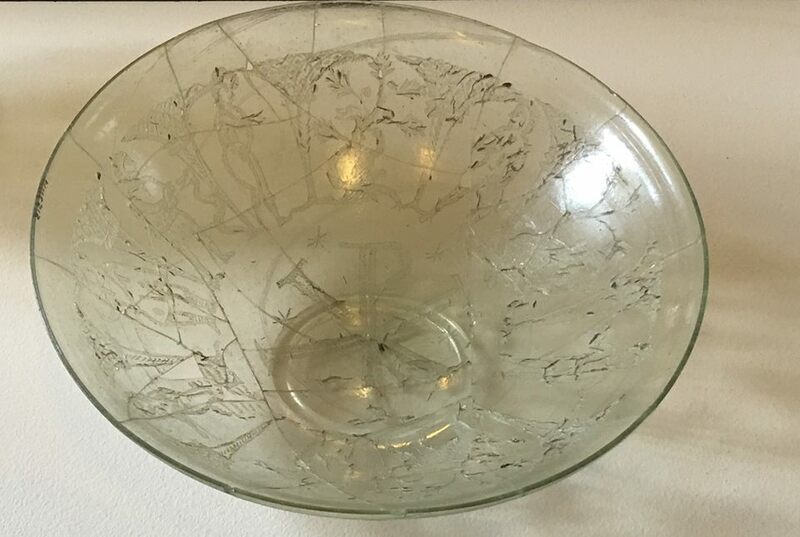 This photo is taken from the order’s website. 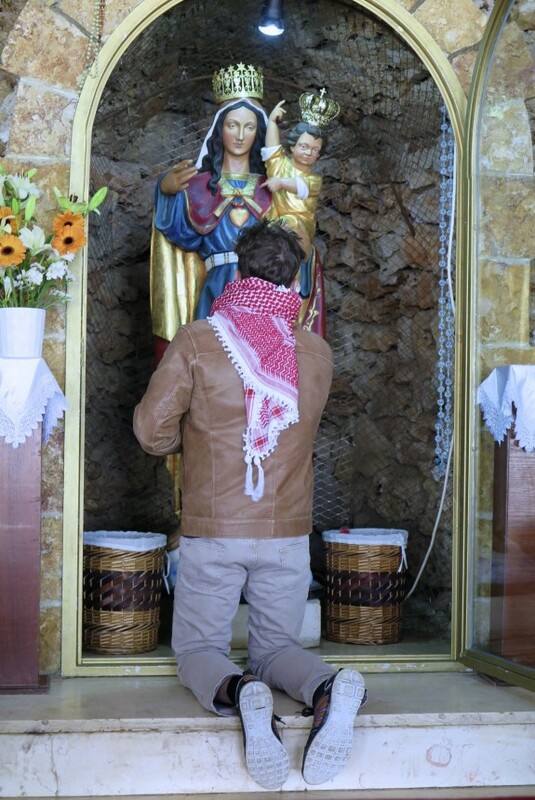 What struck me in the account of the miracle is how the Argentinian priest of the order who is at the Shrine, Fr Nammat, says quite matter-of-factly that he doesn’t know why the miracle should have occurred, except to remark that the “Arab spring”, which has led to the persecution of so many Christians (and Muslims) in the region began shortly afterwards, and perhaps there is a connection. Below: Ian’s Sorrowful Mysteries, with detail below that. 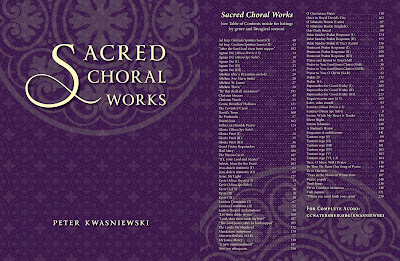 In addition to rescuing the forgotten treasures of our Catholic musical tradition from the dust-heap of history, our regular contributor Dr Peter Kwasniewski somehow finds the time to make his own original contribution to it, in the midst of his teaching and writing. 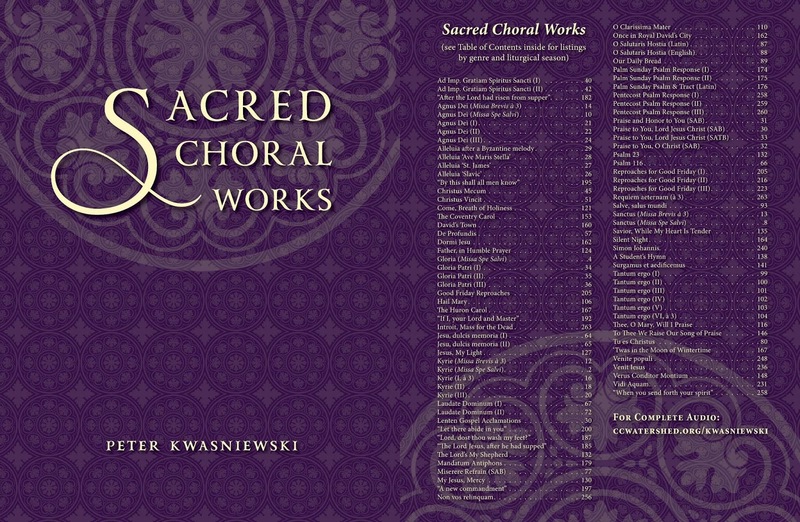 His collection of Sacred Choral Works was published by Corpus Christ Watershed in 2014, a treasure-trove of choral music in Latin and English, written in an accessible style. Since the feast of the Ascension is coming up next week, it seems a good idea to address the following matter which was brought to my attention by a regular reader, regarding the concept of the external solemnity of this and other feasts in the Extraordinary Form. 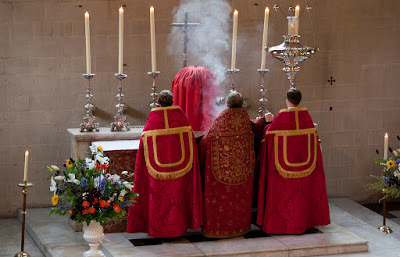 In the Ordinary Form of the Roman Rite, certain feasts which were traditionally celebrated on a weekday, such as the Ascension and Corpus Christi, may be permanently and entirely transferred to the following Sunday at the discretion of the local bishops’ conference; such is the case with both of these feasts in the United States. In such places, the Thursday on which the feast was historically celebrated simply becomes a ferial day, or the feast of a Saint. To give an example, this year, Thursday May 26th is in the United States the feast of St Philip Neri, an obligatory memorial, because Corpus Christi in its entirety is kept on the following Sunday. 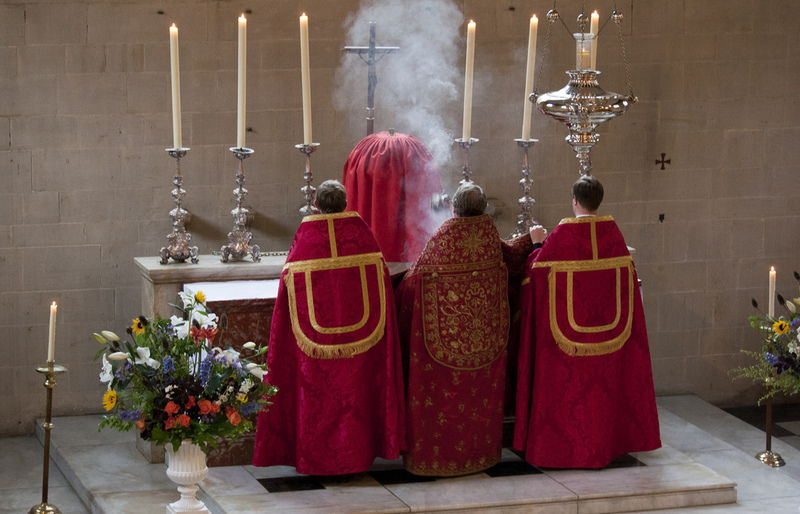 In the Extraordinary Form, however, these feasts are not transferred; it is obligatory to celebrate both their Mass and Divine Office on the traditional days, which this year are May 5th and 26th. The “external solemnity” is a pastoral provision which may be made, but is not obligatory, in cases where a reasonable number of the faithful are unable to attend the feast on the day itself. The Mass of the feast is repeated, but the Office is not changed to match it; the rubrics of the 1962 Missal (numbers 356-361) describe it as “celebratio … festi absque Officio – the celebration of the feast without the Office.” Whereas on the feast day itself, a church may celebrate as many Masses of the feast as are possible, desired, or necessary, only two may be said of the feast on its external solemnity (number 360), and only one of them may be sung. 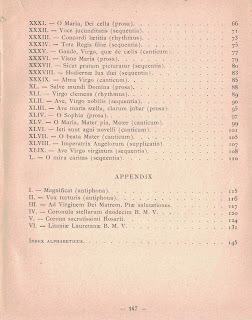 Further, it should be noted that according to this rubric, there are only two feasts to which an external solemnity is automatically granted, those of the Sacred Heart and the Holy Rosary; the former may be repeated on the following Sunday, the latter on the first Sunday of October, whether before or after its fixed date of October 7. The original logic of the external solemnity, by the way, was that it applied to feasts which had octaves, and therefore corresponded to at least a part of the Office, namely, the commemoration of the feast in the Sunday within its octave. 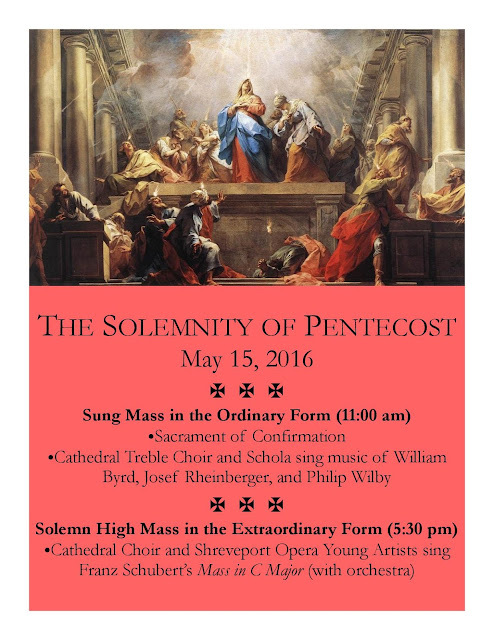 The Cathedral of St. John Berchmans in Shreveport, Louisiana, located at 939 Jordan Street, will have Masses with the music of William Byrd and Franz Schubert inter alios (the latter with an orchestra) for the Feast of Pentecost on May 15. Details in the poster below. This post has been updated with a more accurate description of the use of the chant in question, and a video posted yesterday of a live recording of it at the Ukrainian Greek-Catholic Cathedral of St George in Lviv. The new video begins with one of the best Alleluias of the Slavonic chant repertoire. Those who follow the Julian Calendar are now in the midst of Holy Week, and via the Facebook pages of some Ukrainian and Greek friends, I just discovered this especially beautiful chant, a troparion for Matins on the first three days of the week, which has given its name to the service, Bridegroom Matins. Here is a version in Old Church Slavonic, sung by the always-impressive choir of the Sretensky Monastery in Moscow. Behold the Bridegroom cometh in the midst of the night, and blessed is the servant whom He shall find watching; and again, unworthy is he whom He shall find heedless. Take care, therefore, oh my soul, lest thou be borne down down with sleep, lest thou be given up to death, and be shut out of the kingdom; but rouse thyself, crying, Holy, Holy, Holy are Thou O God. * Through the Mother of God, have mercy on us! Се Женихъ грѧдетъ въ полунощи, и блаженъ рабъ, егоже обрѧщетъ бдѧща: недостоинъ же паки, егоже обрѧщетъ унывающа. блюди убо душе моѧ, не сномъ отѧготисѧ, да не смерти предана будеши, и Царствиѧ вне затворишисѧ, но воспрѧни зовущи: Свѧтъ, Свѧтъ, Свѧтъ єси Боже, Богородицею помилуй нас. Here is a another very beautiful version in Arabic. Here is early notice of a conference that will take place in the fall. The Catholic Artists’ Conference is intended to encourage and guide Catholic artists and patrons. The central theme and title of the conference is Prayer: Art from the Heart of God; you can read more about it at Catholic-Artists.com. Among the speakers will be Bishop James Conley of Lincoln, Nebraska. In conjunction with the conference will be the US debut of the Faces of Christ exhibition, with works by living artists from around the world; for more information, go to http://www.faces-of-christ.com/. I have attached below images of the conference and exhibition promotional material; reminders will be posted as we get closer to the date. Choirs and scholas often like to have a selection of devotional chants for ad libitum use. Books like The Parish Book of Chant have done an admirable job in this regard, but I often find there is a real dearth of Marian chants. 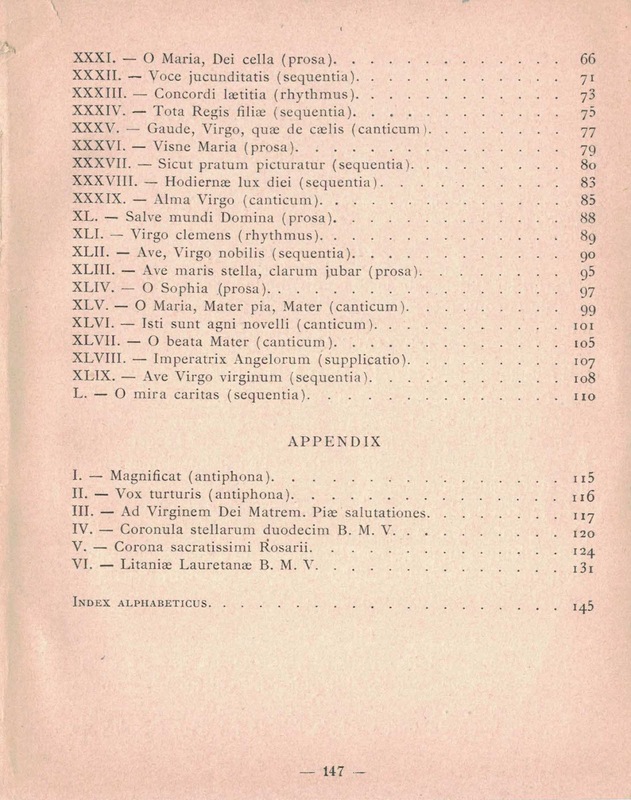 I was therefore delighted when, some years ago, friends of mine delivered to me three copies of an exceptionally rare book published in 1903, Cantus Mariales, that contains 50 beautiful Marian chants for the entire Church year, as well as an Appendix of several litanies and antiphons. I am happy to announce today the publication of a facsimile edition, bringing this volume once again to choirs and scholas everywhere. The story of how I came by these books is quite interesting. 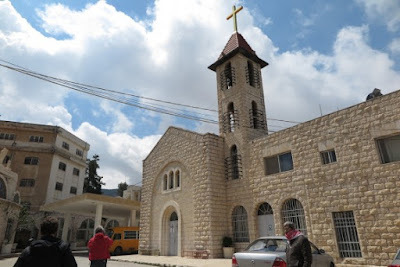 My friends were visiting Jerusalem, and happened to enter a monastery called St. Pierre de Sion, otherwise known as the Ratisbonne Monastery. They somehow got up into the choir loft (which is exactly what I would have tried to do myself!) and found a stash of old chant books, covered with dust and in various stages of disrepair, and evidently unused. When they asked a person who lived there if they could buy any of the books, he shrugged his shoulders and said: "Go ahead and take them, no one's using them." When my friends got back to Austria, they gave them to me and said: "You should be the one to get these, you'll know what to do with them." The short chant antiphons given for announcing each of the traditional 15 mysteries of the Rosary (pp. 125-31) are fascinating and could elevate the communal recitation of the Rosary in places where that is a custom, e.g., during a public Holy Hour. 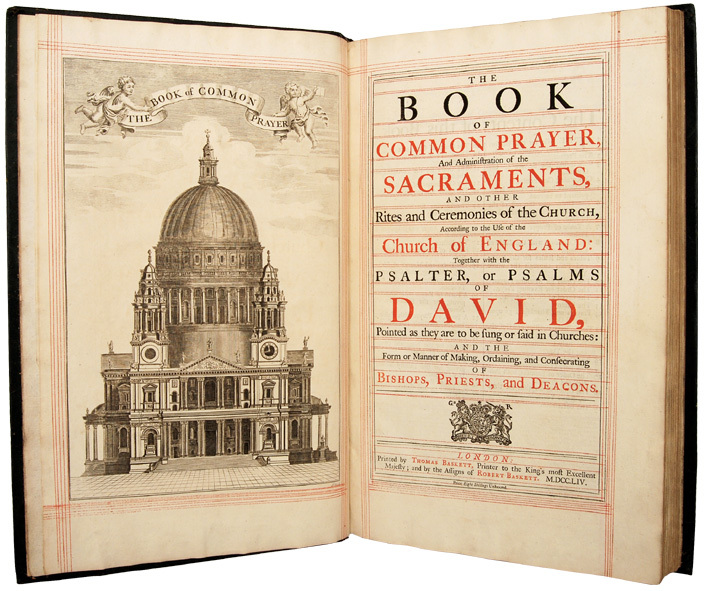 The three original copies appear to be hand-produced: the pages show obvious signs of having been printed, cut, and assembled in small batches; each cover is marbled in a distinctive manner, and each book has discrepancies of spacing and placement, not to mention pencil and pen markings. The one I dismantled for scanning was in good shape and had few extraneous markings. I am happy to announce the availability of a full-color facsimile edition identical in content to the original, with a new cover. A four day workshop-retreat for those who want to learn how to sing and lead Gregorian chant will take place from Tuesday, June 21, through Friday, June 24, at the Wethersfield Estate in Amenia, New York. Two Dominican priests will lead the workshop, Fathers Vincent Ferrer Bagan and Innocent Smith, both of whom have studied chant and church music and have led church and school choirs in singing chant. They also collaborated in ﻿Ave Maria: Dominican Chant for the Immaculate Conception,﻿ a recent recording by the friars of the Dominican House of Studies in Washington, D.C. 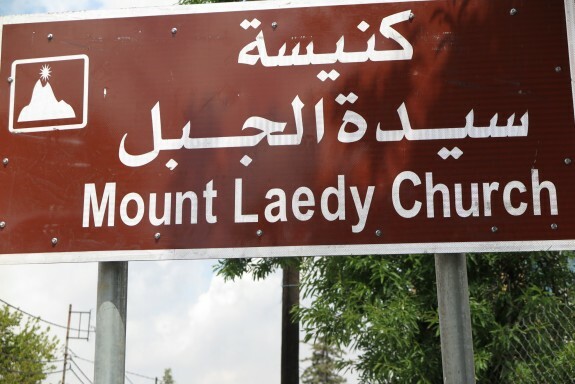 In addition to formal instruction time, the workshop will include singing chant in the Church’s liturgy as well as discussion about the place of chant in the churches and schools from which the participants come. The $150 fee includes room and board for the four-day retreat/workshop. For more information and to register, please contact Nicole Martin at ﻿nmartin@hlfoundation.org. For this reason, in the pre-Tridentine editions of the Roman Breviary, the single historical lesson of his feast consists of only two brief statements. “In the Persian city of Diospolis, the passion of St George the Martyr. Although the deeds of his passion are counted among the apocryphal writings, nevertheless, the Church honors his most illustrious martyrdom with veneration among the crowns of the martyrs.” Diospolis, also called Lydda, was actually in the Roman province of Syrian Palestine in George’s time; renamed Georgiopolis in the early Byzantine period, it is now in the state of Israel, and called by its Hebrew name Lod. Nothing is said about the era of his martyrdom, which took place in the persecution of Diocletian, from 303 to 306. In the Breviary of St Pius V, not even this brief notice was retained, and generic lessons from the common of Martyrs in Eastertide are read instead. The feast itself, however, remained as a semidouble, even though many other Saints with dubious passions were either removed from the calendar, or reduced to commemorations. (In 1568, when the first edition was published, semidouble was the second of three grades of feasts.) This would seem to be an act of recognition that the skepticism of the hagiographers, however long-standing or well-founded it may be, must yield to popular devotion; a principle also recognized, for example, when the feast of St Catherine of Alexandria was restored to the general Calendar in 2002. The Western Church’s reserve towards St George’s history does not seem to have impeded that devotion in the least, as witnessed among other things by the popularity of his name, which derives from the Greek word “geōrgos – a farmer.” He is honored as the Patron Saint of many places, including over 150 cities and towns in Italy, and most famously, of England, although it is not clear how exactly the latter came about. In art, St George is traditionally shown as a knight on horseback in the act of killing a dragon, which in a particular region (the Golden Legend says a city in Libya, but there are many versions of the story), was about to eat the local king’s daughter. Surprisingly, this is not the legend to which the Gelasian Decree refers as a possible occasion for mockery, as it was unknown before the 12th century. 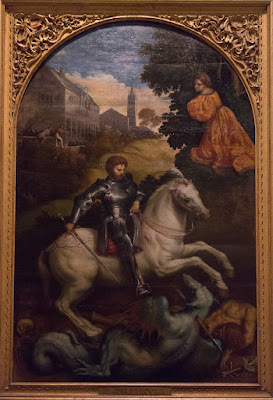 This fact this has not stopped some of the more cynical hagiographers (perhaps “credulous” would be a better way to describe them,) from describing St George as a Christianized version of the Greek mythological character Perseus, who slew a different and much larger monster as it was about to eat a king’s daughter. The Byzantine Rite has no such reservations about St George, as is often the case with some of the best loved legends and traditions about the Saints. He is honored with the titles “Great Martyr”, meaning one who suffered many and various torments during his martyrdom, and “Bearer of the Standard of Victory”; in the preparation rite of the Divine Liturgy, he is named in the company of martyrs second only to St Stephen. His feast always occurs in Eastertide, unless it be impeded by Holy Week or Easter week; one of the texts for Vespers of his feast refers to this in a very clever way. Thou didst suffer along with the Savior, and having willingly imitated His death by death (thanato ton thanaton … mimesamenos), o glorious one, thou reignest with Him, clothed in bright splendor, adorned with thy blood, decorated with the scepter of thy prizes, outstanding with the crown of victory, for endless ages, o Great-Martyr George. The conference is open to anyone. Registration will open in the morning of Tuesday, 5th July at 10h00 at the London Oratory (St Joseph's Hall). Conference sessions will be held at the central location of Imperial College in South Kensington, a distinguished research university with excellent conference facilities. The inaugural session with the address by Robert Cardinal Sarah will begin at 17h30pm on Tuesday, 5th July (preceded by Vespers at the Oratory Church, see below. On Wednesday, Thursday and Friday, the morning sessions will run from 9h00 to 13h15 (with a coffee break). The afternoon sessions will run from 14h30 to 17h30 (with a tea break). The conference is non-residential: delegates are responsible for their own accommodation and meals, though tea and coffee will be provided each day. Conference delegates will be able to use the cafés and restaurants of the Imperial College campus for meals. Click here to view and download the complete programme. Celebrant & Preacher: Robert Cardinal Sarah, Prefect of the Congregation for Divine Worship and Discipline of the Sacraments. Celebrant: Mgr Keith Newton, Ordinary of the Personal Ordinariate of Our Lady of Walsingham. All liturgical celebrations will be open to the public. Seating will be reserved for conference delegates. Conference delegates will receive a ticket for admission to the Concert of Sacred Music; other tickets may be available for the public space permitting. Priest delegates will need to make their own arrangements to celebrate Mass, and are reminded of the need for a valid celebret. Tuesday, April 26, 7 pm: Basilica of St. Josaphat, Milwaukee, Wisconsin - Mass of Confirmation; Propers for the Sacrament of Confirmation composed by Jernberg will be sung, as well as the Mass of St. Philip Neri. Sunday, May 22, 10:30 am: Holy Family Parish, Whitefish Bay, Wisconsin - First Mass of Thanksgiving. Wednesday, May 25, 5 pm: St. Paul Cathedral in Oakland (Pittsburgh), Pennsylvania, Mass of Ordination to the Priesthood and Diaconate for the Pittsburgh Oratory of St. Philip Neri; the Mass of St. Philip Neri will be sung. This Ordination will be taking place on the Vigil of the Feast of St. Philip! I have no doubt that Paul’s music will makes these all the more beautiful and solemn. Below you can hear excerpts from his Mass of St Philip Neri and his Salve Regina. Skyler Neberman is a student of Theology and Philosophy at Benedictine College, and hopes to continue on to graduate studies in Systematic Theology and the Liturgy. He is interested in the restoration of Gregorian chant, especially in the Divine Office, and the Mixolydian is his favorite mode. We are very pleased to be able to share with our readers this article which he has written on the Office of Vespers as a Sacrifice. One of the first experiences that began my formation in and devotion to the Liturgy was attending Cathedral Vespers in my youth. Though I have since experienced much more solemn Vespers in many rites and forms, I was struck even in that office’s simplicity, which stirred a dormant sense that it was “right and just” to worship at eventide. Vilma Little says in The Sacrifice Of Praise, “Of the two original offices of praise the Evening Hour has always been the prime favorite. It was in the calm of evening that God walked with our first parents in the Garden.” That Evensong stirred something of the first homo adorans that awoke in the evening of Creation, when the evening star first arose upon the imagines Dei, who saw it and offered thanksgiving to God. In this essay I will attempt to trace the tradition of the early Church in an effort to discern the theology of the office of Vespers, especially the understanding of Vespers as the evening sacrifice of the Last Supper and of Christ on the Cross. 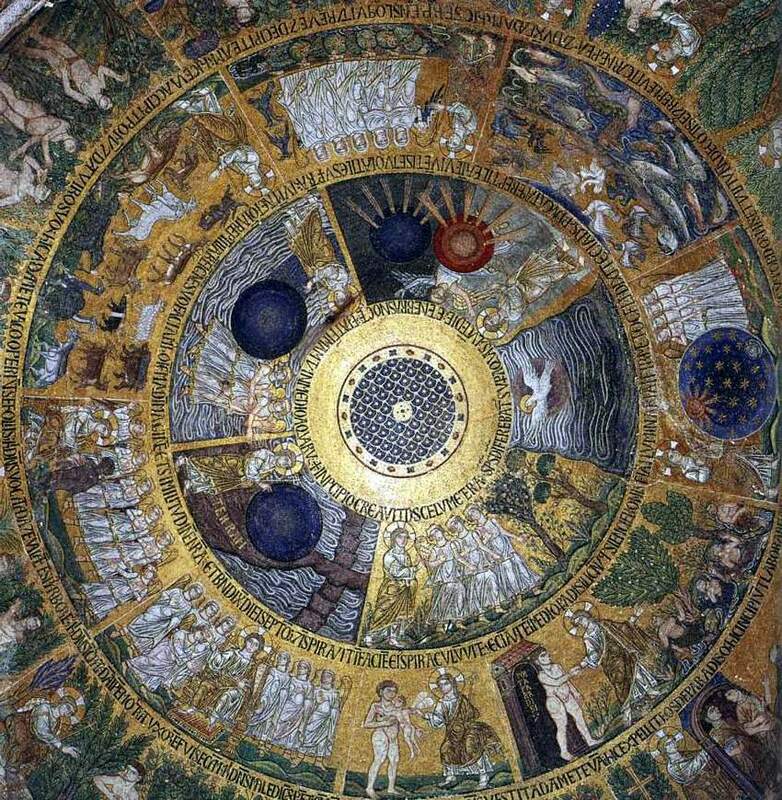 The Creation of the World; mosaic in one of the cupolas of the Basilica of St Mark in Venice, 1215-35. The liturgy of the hours has its earliest roots in the Jewish Temple sacrifices and prayers. Exodus mandates “thou shalt sacrifice upon the altar: Two lambs of a year old every day continually. One lamb in the morning and another in the evening. … It is a sacrifice to the Lord, by perpetual oblation unto your generations” (Ex 29:38b-39, 42a). 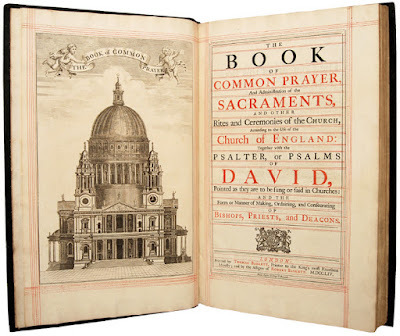 When the Divine Office comes into its own in the 4th century, the Church Dathers develop this connection, but as Fr Robert Taft says in The Liturgy of the Hours in East and West, the “raw material and symbols for what would later become the Liturgy of the Hours” are already present. Cassian is saying that Vespers is the Evening Sacrifice of Christ on the cross and the offering of the Last Supper, the fulfillment of the old Jewish Temple sacrifices wherein the Lamb of God is offered. 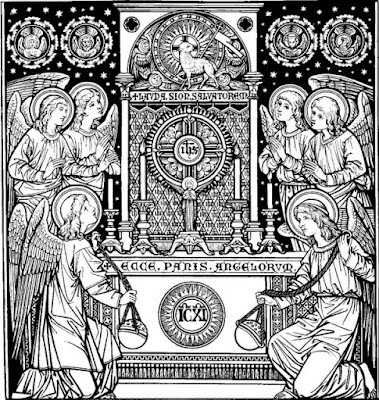 But how can it be the Evening Sacrifice without the Eucharist? The answer can be found in Psalm 115, 17, “I will offer to you the sacrifice of thanksgiving, and call on the name of the Lord,” as well as in Psalm 49, 23 “He who brings thanksgiving as his sacrifice honors me; to him who orders his way aright I will show the salvation of God!” The psalmist writes in Psalm 140 “Let my prayer be counted as incense before you, and the lifting up of my hands as an evening sacrifice!” The offering of our selves in worship is a sacrifice of praise and thanksgiving, as the author of the Epistle to the Hebrews writes, “Through him then let us continually offer up a sacrifice of praise to God, that is, the fruit of lips that acknowledge his name. Do not neglect to do good and to share what you have, for such sacrifices are pleasing to God” (13, 15-16). At Vespers we offer up to God, not the Bread of Heaven which is the Body and Blood of Christ under the appearance of bread and wine, but rather the Bread of Heaven as the word that proceeds from the mouth of God (cf. Mt. 4:4). The General Instruction of the Liturgy of the Hours says this. In the Liturgy of the Hours, the Church exercises the priestly office of its Head and offers to God ‘without ceasing’ a sacrifice of praise, that is, a tribute of lips acknowledging his name. … All who render this service are not only fulfilling a duty of the Church, but also are sharing in the greatest honor of Christ’s Bride for by offering these praises to God they are standing before God's throne. 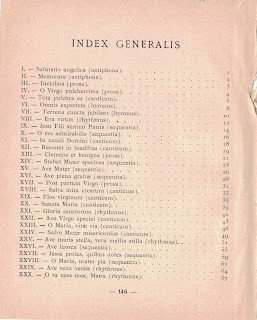 (I-III.15). Today, the Divine Office has to a large degree fallen by the wayside in terms of devotion, but given the incredible purpose that it fulfills—especially in Vespers—of bringing us into the eternal worship of God, we should strive to celebrate it in our Cathedrals, Parishes, religious communities, and even our families, and where possible, with the greater perfection of Gregorian Chant, as the music proper to the Roman Rite. 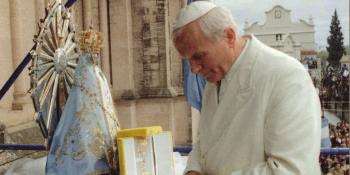 Benedict XVI makes this very exhortation in Verbum Domini (62), asking that prayer of the Liturgy of the Hours, especially Lauds and Vespers be promulgated among the people of God: “Emphasis should also be placed on … First Vespers of Sundays and Solemnities … To this end I recommend that, wherever possible, parishes and religious communities promote this prayer with the participation of the lay faithful.” In the Church offering Vespers with greater frequency and devotion, we her members may better enter into the mystery of the eternal offering of Christ the eternal high priest and sacrificial lamb, and ultimately reach consummation in the vision of Divine light, to which humanity was first drawn when they looked upon the stars and gave thanks. In his recent NLM article The Omission that Haunts the Church, Dr Peter Kwasniewski rightly observes that the omission of 1 Corinthians 11:27-29 from multiple points in the usus recentior has contributed to the contemporary crisis over who can receive Holy Communion. There was a brief but interesting exchange in the comments section of the article about whether or not it was licit for a priest or lector to include vv. 27-29 in the relevant Ordinary Form readings. I thought this question deserved some further consideration, since the rubrics governing this, as well as their history, are actually quite interesting to look at. 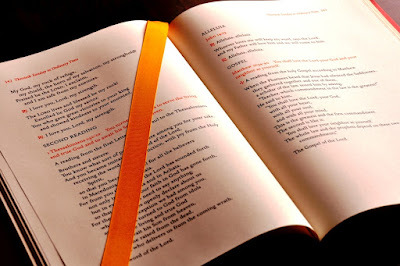 With regard to the topic at hand, the General Introduction to the Lectionary (GIL) states that “in the celebration of Mass the biblical readings with their accompanying scriptural chants may not be omitted, shortened, or, worse still, replaced by non-biblical readings” (GIL 12). It should be noted that this paragraph has nothing to say on whether or not readings may be lengthened. There is a certain subjectivity as to what the “religious education” or “spiritual formation” of clergy and laity “should” consist of, but I would hope everyone can agree that knowledge of Who one is receiving and of the dispositions necessary to receive Him in Holy Communion are an essential part of this (cf. Code of Canon Law 913.1, 915-916, 919.1; Catechism of the Catholic Church 1384-1387, 1415). Thus, we are entitled to ask: can the omission of 1 Cor. 11:27-29 be justified based on what the OF lectionary says about itself in this section? To state the question differently: can the addition of these verses be defended on the basis that their exclusion unjustly deprives the faithful of the spiritual riches that are rightly theirs? Dominicis et sollemnitatibus assignantur tres lectiones, scilicet Prophetæ, Apostoli et Evangelii, quibus populus christianus ad continuitatem operis salutis, secundum mirabile propositum divinum, educatur. Hæ lectiones stricte adhibeantur. Diebus dominicis et festis assignantur tres lectiones, scilicet Prophetæ, Apostoli et Evangelii, quibus populus christianus ad perennitatem operis salutis, secundum mirabilem disciplinam divinam, educatur. The treasures of the bible are to be opened up more lavishly, so that richer fare may be provided for the faithful at the table of God’s word. In this way a more representative portion of the holy scriptures will be read to the people in the course of a prescribed number of years (my emphases). That is why many of you are weak and ill, and some have died. But if we judged ourselves truly, we should not be judged. But when we are judged by the Lord, we are chastened so that we may not be condemned along with the world. These verses most certainly “correspond to the principal themes” (cf. GIL 108) of Corpus Christi as expressed in the Collect common to the OF and EF: tribue, quæsumus, ita nos Corporis et Sanguinis tui sacra mysteria venerari, ut redemptionis tuæ fructum in nobis iugiter sentiamus (“grant us, we pray, so to revere the sacred mysteries of your Body and Blood that we may always experience in ourselves the fruits of your redemption”). In any case, it is to be hoped for that the Holy See will correct this and other serious omissions in the Ordinary Form lectionary in the years to come. Until then, bishops, priests and deacons should be strongly encouraged to read these verses in the one place in the OF where it is licit to read them: the homily. Some are also surprised to be informed that the Church does not read the entirety of all four Gospels every year (or every three years), or the whole New Testament every two years, for example. I am not sure quite where these sorts of myths about the OF lectionary originated, but they certainly need to be debunked when possible. 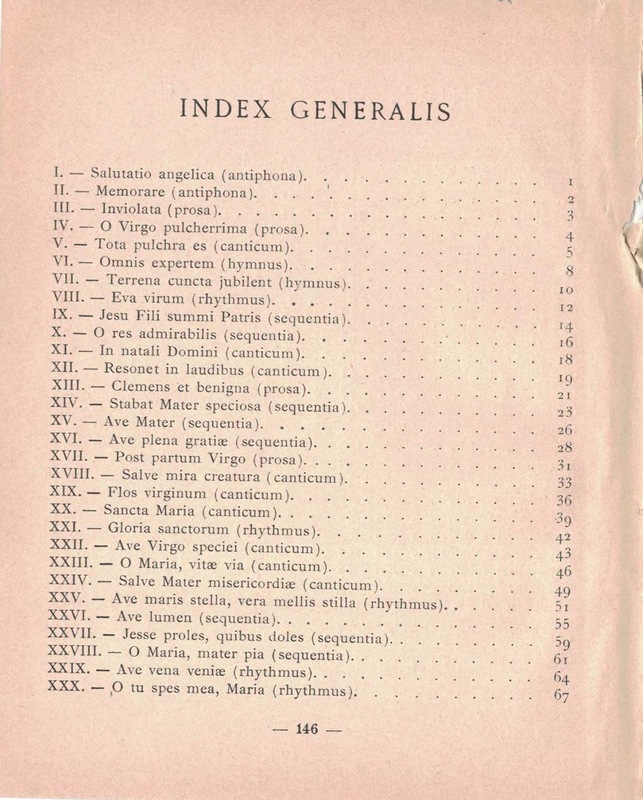 The Index Lectionum is available from Amazon (US, UK, France, Germany, Italy, Spain). In his Foreword to the book, Dr Kwasniewski goes into more detail about some of the readings and verses in the EF that have been omitted from the OF. “In the case of certain rather long texts, longer and shorter versions are provided to suit different situations. The editing of the shorter version has been carried out with great caution.” This is all that the GIL has to say about why long and short forms of certain texts exist in the OF lectionary. However, Phil. 3:17–4:1 (2nd Sunday of Lent, Year C) is not a long text, yet it has a short form (3:20–4:1); Mt. 13:44-52 (17th Sunday per annum, Year A) also has a short form (13:44-46), despite being only 9 verses long! Readers can look at these passages for themselves and quickly deduce perhaps why, in the case of certain rather short texts, even shorter versions are provided. For example, in the following sequence of Sundays in Year C: Neh. 8:2-4a, 5-6, 8-10 (3rd Sunday per annum); Jer. 1:4-5, 17-19 (4th); Isa. 6:1-2a, 3-8 (5th); Lk. 6:17, 20-26 (6th). Text-critical omissions, such as that of v. 44 from Mt. 21:33-46 (read on Friday of week 2 of Lent in the EF and OF) are perhaps the one exception to this rule, though the relationship between text-criticism and tradition certainly warrants further discussion. SC 22 § 3 does say that “no other person, even if he be a priest, may add, remove, or change anything in the liturgy on his own authority”, though it has to be said that the rubrics of the OF (e.g. the frequent use of vel similibus verbis) somewhat undermine this particular section of the Constitution. Whether bishops or bishops’ conferences could mandate the lengthening of particular readings in their dioceses is a separate question (cf. SC 22 §§ 1-2). The Latin Mass Community of Jersey City announces the celebration of a Month’s Mind Requiem Mass for Mother Mary Angelica of the Annunciation, who died on Easter Sunday. The Month’s Mind Mass will take place on Thursday, April 28 at 7:00 pm at historic St. Anthony of Padua Church located in the downtown section of the city at 457 Monmouth St. Mother Angelica was born Rita Antoinette Rizzo in Canton, Ohio on April 20, 1923. She entered the contemplative Franciscan Order of Poor Clares in 1944 and was best known as a television personality and the founder of both the internationally-broadcast cable television network Eternal Word Television Network (EWTN) and the radio network WEWN. In 1981, Mother Angelica started broadcasting religious programs from a converted garage on the grounds of her monastery in Birmingham, Alabama. Over the next twenty years, she developed a media network that included radio, TV, and internet channels as well as printed media. Mother Angelica hosted shows on EWTN until she had a stroke in 2001. She continued to live in the cloistered monastery in Hanceville until her death at age 92 on March 27, 2016. The celebrant of the Mass will be the Rev. Fr. John A. Perricone, who worked with Mother Angelica when producing a series for EWTN. The resident choir Cantantes in Cordibus will sing the beautiful Renaissance Requiem Mass by the Spanish composer Cristobal de Morales. Mass Programs in Latin and English will be available for the congregation. 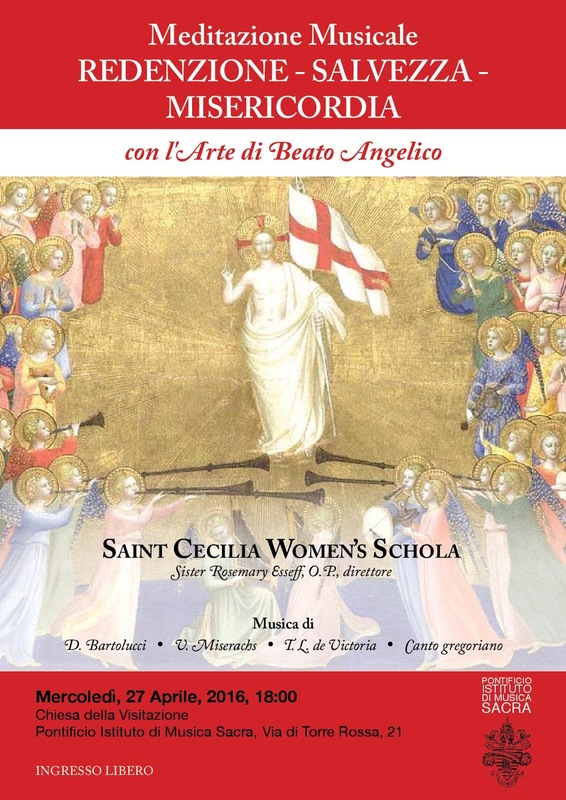 This coming Wednesday, April 27, the Rome-based St Cecilia Women’s Schola will present the latest in its ongoing series of concerts of Gregorian chant and polyphony at the Church of the Visitation, via Torre Rossa 27, starting at 6 pm. The concert is titled “A Musical Meditation on Redemption”, Salvation and Mercy; during the singing, images of the works of the famous Dominican painter Blessed Fra Angelico will be shown on a large screen, selected by Fr Michael Dunleavy, O.P. There will also be readings from the Bible and brief meditations on them. 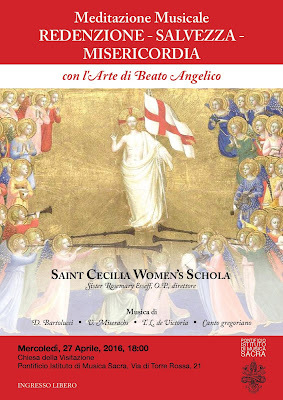 The Saint Cecilia Women’s Schola has a Youtube channel, with recordings from of their previous concerts, . Here is a very nice rendition of the Easter Sequence Victimae Paschali. 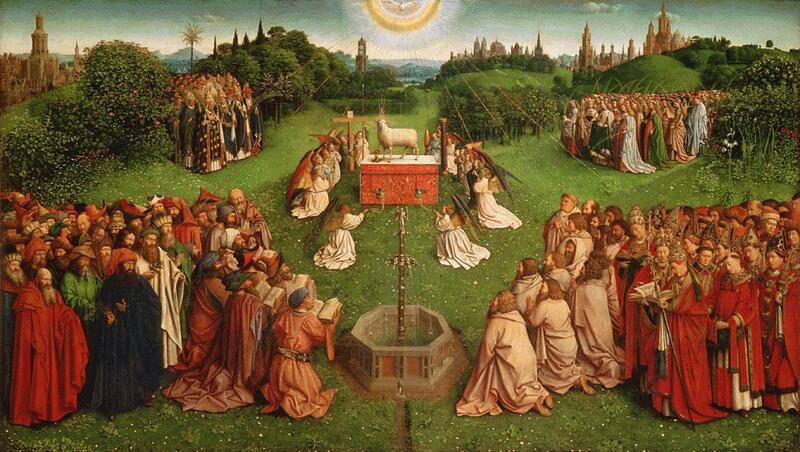 The Ghent Altarpiece - What Makes it So Suited for the Liturgy? 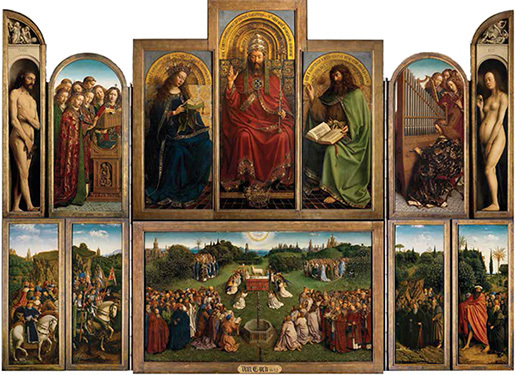 One of the greatest masterpieces ever painted, the Ghent Altarpiece (also known as the “Adoration of the Mystic Lamb”) was created in the 15th century by Flemish brothers Hubert and Jan Van Eyck. While broad appeal is not the only necessary indicator of merit, it is, in my opinion, one of them. 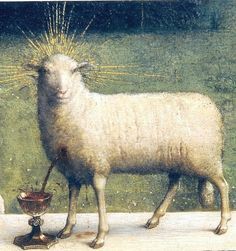 This being so, the Adoration of the Lamb passes the test with flying colors - it is the second most visited and viewed work of art in history, after the Mona Lisa. My consideration of it was prompted by the publication of a book about the altarpiece, The Adoration of the Mystic Lamb, published by Ignatius Press and Magnificat (the one that produces a portable Liturgy of the Hours, sent out monthly). The book is an excellent resource, with large (12in x 12in) reproductions of details, which are as sumptuous as I have ever seen. The commentary, written by French art historian Frabrice Hadjadj, is excellent in its description of the historical background, provenance, and in the details of the content, viewing it as a pedagogical tool. Every figure is identified, and every Latin inscription is translated. In this article, I want to examine additional elements that pertain to the consideration of the altarpiece as a piece of liturgical art, focusing especially on how its design, medium, and Gothic style are all in harmony with its purpose of promoting the right worship of God. These are the things that an artist or patron needs to be aware of when creating new works of liturgical art suited to their purpose. I was invited by Chris Carstens, the new editor of Adoremus Bulletin, to write a review of the book, and what I present here is an adaptation of what I wrote for him. 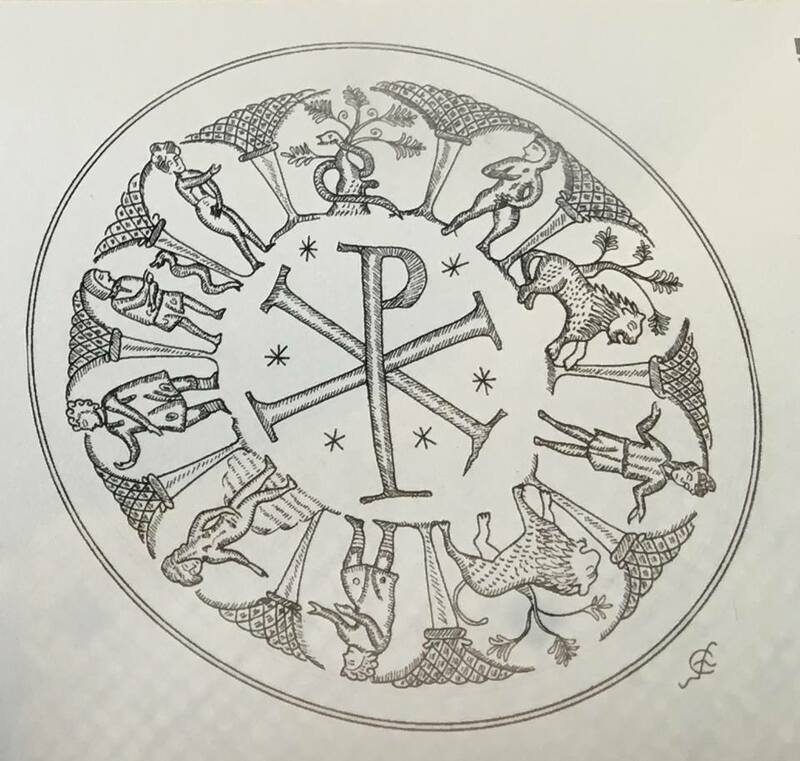 I would recommend, by the way, that this be read in conjunction with Chris’ excellent accompanying piece contained in the bulletin, called Mystagogy of the Lamb, in which he explains in detail the meaning of symbol of the lamb for Christians. Looking now at the famous reredos: when the panels are closed we see, painted largely in monochrome, white and graded tones of sepia through to black, a depiction of the Annunciation watched by a congregation of figures, including two Sybils, the prophets Zachariah and Micah, John the Baptist and John the Evangelist. 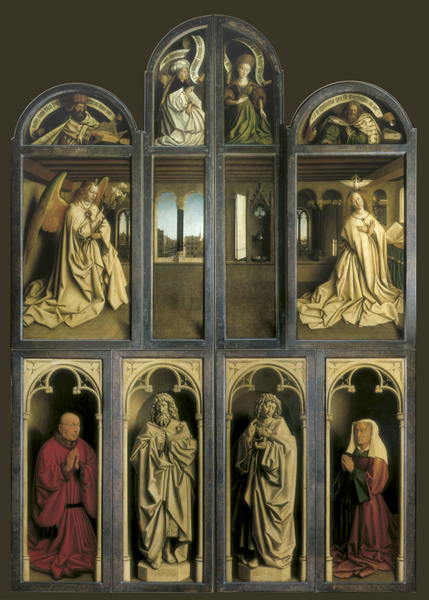 Also making an anachronistic appearance in the scene are the Van Eycks’ patrons, Joos and Isabelle Vijd. To include one’s patrons in a work of art is a typical device for honoring those whose generosity helped make the work of art possible. The figures of the two Johns are of statues in stone, lifeless as well as colorless. When the doors are opened, the scene is in notable contrast, with glorious and bright color. It is dominated by the two largest central panels. The lower of the two is the image which gives the whole piece its name, the Adoration of the Mystic Lamb, in which the heavenly hosts adore the Lamb of God – Christ – standing ‘as if slain’ (as it is cryptically described by the Book of Revelation 5:6). Above this is the figure of God enthroned who looks down blessing us with his right hand. There is some ambiguity as to whether this figure is intended to be the Son or the Father (I will discuss this later). Since January 1st of this year, the Catholic university chaplain of Krems, Austria, has his seat at the Piarist Church of that city, which has become the center of the Campus Ministry. There are over 10,000 students in Krems, a great many international students among them; services are offered in various languages, including English, as well as Bible studies, discussions and spiritual direction. This past Sunday, the Campus Ministry celebrated a special thanksgiving Mass for the establishment of this new location; the Danube Private University choir sung Schubert’s Mass in G. The Mass was well attended and many young people were present. The chaplain, Fr Patrick Schöder, belongs to the Benedictine Abbey Göttweig, near Krems, and was appointed in 2014. The movement for liturgical renewal has reached Austria, and asks for our support in prayer! Our Ambrosian correspondent Nicola de’ Grandi was recently in Paris, and took these photographs of some of the ancient Christian artworks kept at the Louvre Museum. 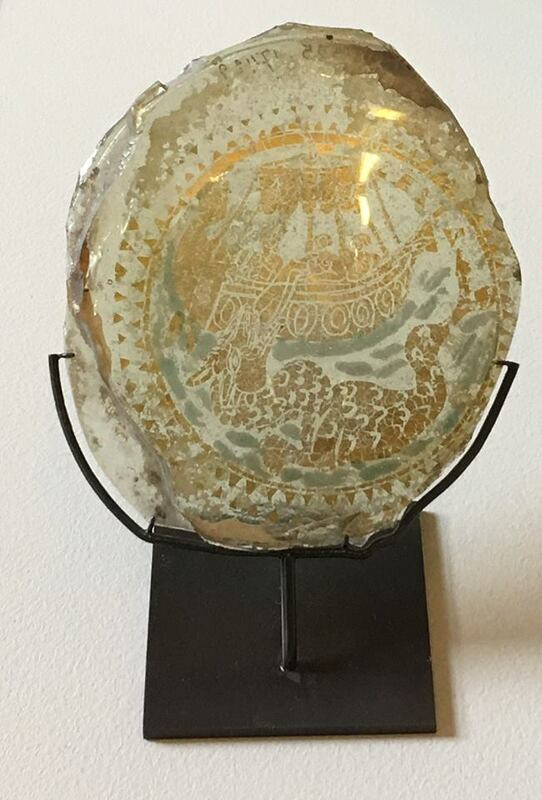 A gilded piece of glass of the type frequent used as grave markers in ancient Christian burial sites; this was a fairly precious object both for its gold, but also because glass was difficult to make in antiquity, and considered a kind of jewel. The image is of the Prophet Jonah being thrown out of the boat, and swallowed by the “whale”, here a large sea monster. (The Hebrew word “bechamah” can also mean either. Jonah was a very popular subject for the ancient Christians as a symbol of the Resurrection of Christ, and of its necessary premises, the Incarnation and Passion. A processional cross in silvered bronze, 6th-7th century. 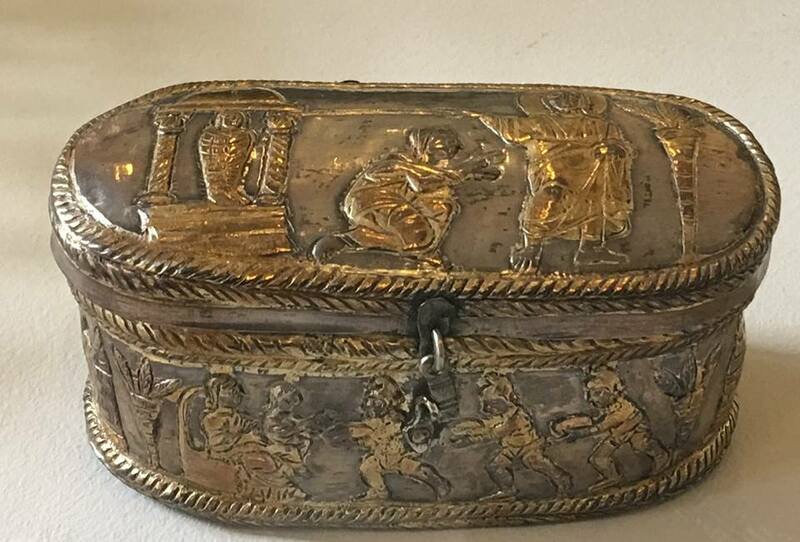 A container for relics, silver, partly gilded, first half of the 5th century, from Brivio, Italy. On the lid, Christ calls Lazarus out of the tomb, while Mary Magdalene prays before Him; on the box, the Magi bringing their gifts to the Christ Child on the lap of His Mother. In the middle: Chrismon surrounded by stars. On the border (starting at 11 o’clock) : Adamo, the serpent, and Eve; Daniel in the Lions’ Den; Susanna and the Elders; Daniel before the serpent of Babylon.